Whyte’s classic 1980 study of New York’s plazas started a mini-revolution in urban planning and design. Out of print for six years, PPS has acquired the rights and is thrilled to make this important book available again to the public. For more than 30 years, Project for Public Spaces has been using observations, surveys, interviews and workshops to study and transform public spaces around the world into community places. 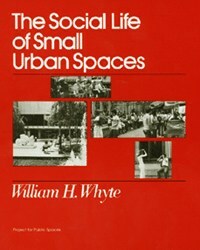 Every week we give presentations about why some public spaces work and why others don’t, using the techniques, ideas, and memorable phrases from William H. “Holly” Whyte’s The Social Life of Small Urban Spaces. Holly Whyte was both our mentor and our friend. Perhaps his most important gift was the ability to show us how to discover for ourselves why some public spaces work and others don’t. With the publication of The Social Life of Small Urban Spaces and its companion film in 1980, the world could see that through the basic tools of observation and interviews, we can learn an immense amount about how to make our cities more livable. In doing so, Holly Whyte laid the groundwork for a major movement to change the way public spaces are built and planned. It is our pleasure to offer this important book back to the world it is helping to transform.